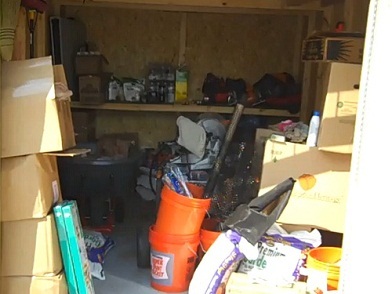 With so many of us working in the garden every day the storage shed where we keep our supplies has gotten, shall we say a little “cluttered”. OK it’s a mess, but what better opportunity to show what a little planning and elbow grease can accomplish. So join us as we highlight some of the steps we took to create a clean and well organized work space. The first step in almost every project is planning. When it comes to organizational projects this is critical, as it can save you a ton of time and cost. · What items you have to store. · What space is available. 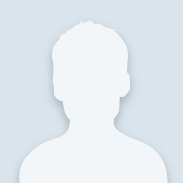 · How you want things organized. · What is used frequently or seldom. · What is your desired result. Keeping those thoughts in mind not only keeps you focused but also helps you adjust your plan quickly if part of the plan needs to be adjusted. In my case I always keep doodle on hand as my go to reference. Before you can start to organize you have to be able to see the space you have to work with. As you can see in the image below, that wasn’t really possible. So before we did anything we removed everything from the shed. 1. It allowed us to fully realize the available space. 2. We made decisions on what had to go and what we would be keeping. 3. It provided a great opportunity to sort items into groups so that putting them back into the shed would be faster and simpler. An organized workspace creates an environment where you can always quickly lay your hand on whatever items your project calls for. Not having to waste precious time searching for just the right screwdriver keeps you on task and on time with your project. 1. Prevents re-purchase of items and materials you already have. 2. Makes finding items that much quicker. 3. Means you’re getting the maximum usage out of the available space. When coming up with your organizational plan you will want to keep frequently used items within reach, while lesser used items can be stored out of the way. 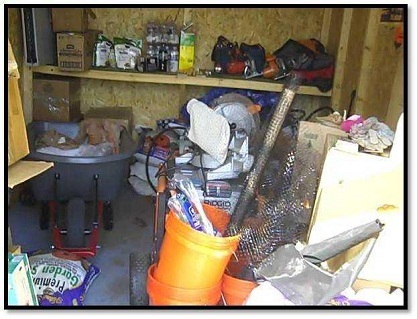 Shovels, brooms, rakes, and other long handle tools are all items we use often. In our shed we placed these items together along a wall with a Smart Rack system, which makes for a great easy access solution. We used Handy Hooks for our extension cords and hoses to keep them neatly coiled and out of the way. Lining the back wall of the shed with peg board made it easy for us to hang smaller tools like trowels, hammers, and drills within reach. This also had the benefit of making the work bench in the rear of the shed that much more useful when constructing or repairing items for the garden. We hope this has been helpful and informative and if you have any questions or organizational ideas you’d like to share don’t hesitate to comment. Hello I have been trying to find the instructions on how to put together a shed the brand is Keter and had no luck at all until my search came back to the HD it is the 6x8 with two windows I am hoping that you will know how to get the directions or instructions to reassemble as I bought this used and the instructions did not come with it. Greetings 4horses and welcome back to the community!!! After doing some research I found an assembly guide on a Keter Apex shed. This is the only Keter shed that had 2 windows. 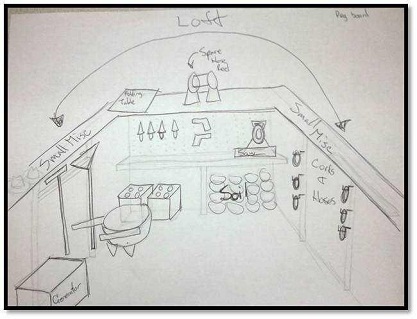 Here is the assembly guide; depending on if this is the same shed you have it will give you a good idea on what to do. 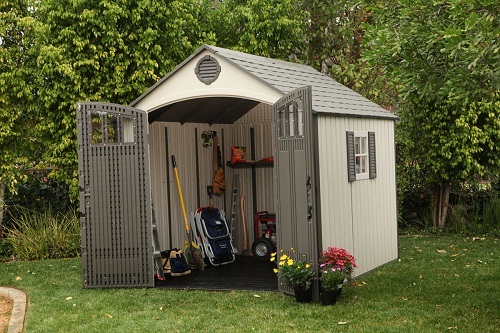 Before you assemble your shed it’s going to need a good base to help it from sinking into the ground over time. I have a great link to a post on shed foundations to help give you an idea on what types of ways a good foundation can be done. A good shed foundation is key to making sure it stays where you want it to be. 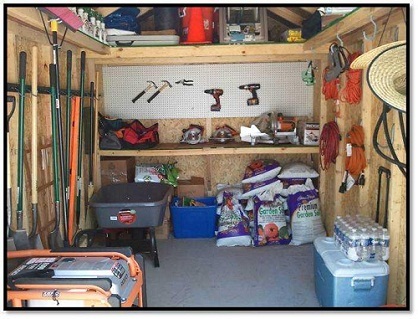 A second set of hands is always a good idea when it comes to a shed since there is a ton of pieces and it will make the job go a lot smoother. If you run into any problems or have any questions feel free to write back. Also if you could post some before and after pictures would be great!!! This looks great, but my shed is one of those very large metal ones. I’m looking for suggestions for safely attaching 2x4s or bigger to the metal walls, on which I could utilize the above ideas – i.e., attach hanger hooks, Smart Rack systems, etc. Don’t want the weight of these attachments to bend the metal walls and have them pull into the shed (i.e., collapse). I KNOW you have ideas. You always have ideas. So bring 'em on. How can Lorrrie mount 2x4s in her metal shed?